Giant dog breeds are basically extra large canines. In general, dog breeds that have typical healthy weights of over 100 pounds fall into to the giant dog breeds category. Despite their size, most of these extra large dogs are truly gentle giants. People who love giant dogs often cannot imagine having a "normal" size dog! Like any type of dog, giant dog breeds have their pros and cons. On the positive side, giant dogs are typically very gentle, affectionate and loyal. Many giant dogs will not have extremely high energy levels and will not need tons of exercise. In addition, many giant dog breeds are fairly easy to train. Potential negatives include an increased cost of food, supplies, and veterinary care. Some giant dogs also have large jowls, making them drool quite a lot (their owners usually carry a rag around to clean up all the drool). In addition, many large dogs are more prone to orthopedic problems or health issues like bloat. Perhaps the most unfortunate thing is that extra large dog breeds tend to have a shorter lifespan compared to the average canine (about 6-10 years compared to the 12-15 years most dogs live). However, those who adore these big beauties feel that it adds up to a small price to pay. Typically weighing anywhere from 100 to 200 pounds, giant dogs need ample space in their homes for large dog beds and plenty of tail wagging space. You don't need a mansion to have a giant dog. However, small, cramped spaces will make it uncomfortable for you and the dog. When these big dogs are young and not fully trained, they may not know their size and strength. They might be clumsy and awkward, unintentionally knocking over furniture and even small children. However, with age and proper training, they usually become gentle giants. Be aware that many giant dogs will not reach full size until they are about 2-4 years of age. Proper training and socialization are absolutely crucial for your giant dog. If you are unable to control your giant dog, he can inadvertently hurt you or other people! Giant dogs should learn how to walk on a loose leash, sit or lie down, stay, and act calm around other people and dogs. If not, you won't be able to take your giant dog anywhere. When feeding your giant dog, you may wish to feed a special large breed formula to help support joints. It can be especially helpful to feed giant breed puppies a special large breed diet to prevent them from growing too rapidly (these diets light minimize common orthopedic issues). Be sure not to overfeed your giant dog. Obesity causes health problems in dogs of all sizes, but even a little extra weight in a giant dog breed can lead to orthopedic problems like arthritis. Make sure your giant dog visits the vet for routine wellness examinations. These should occur at least once or twice a year. As your giant dog approaches senior years (around age 6 and up), see the vet at least twice a year so health problems may be detected before they get out of control. Ask your vet for recommendations on the frequency of exams. 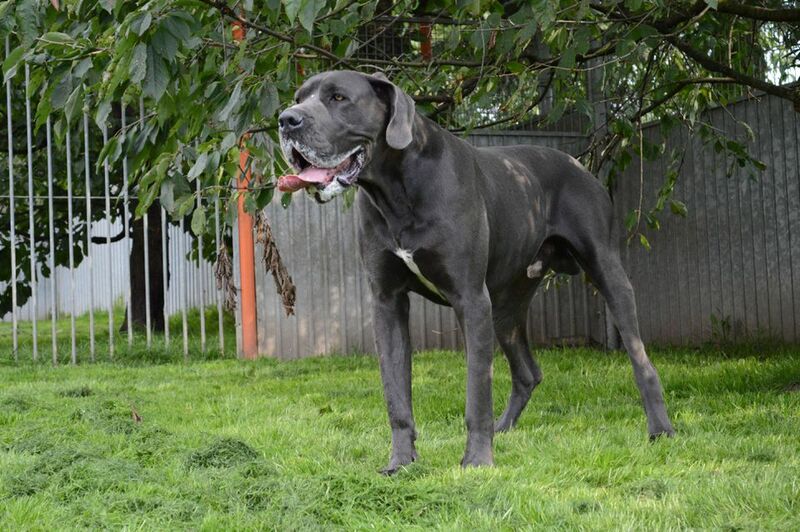 Your vet will also advise you about supplements and other things you can do to support your giant dog's health.